MoSS? Madness 2012 Championship | Music or Space Shuttle? The votes are in. After weeks of debate, hours of agonizing decision making and unknown amounts of work productivity lost, we are finally down to the last 2 remaining artists in the MoSS? 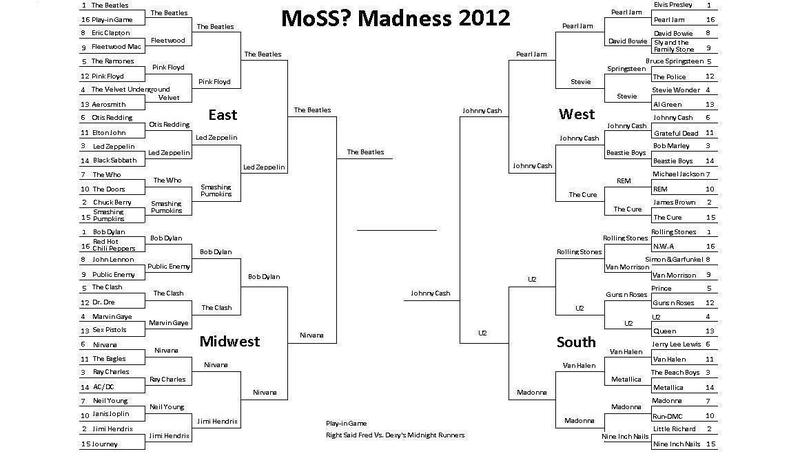 Madness 2012 Tournament. The final match-up will be between The Beatles juggernaut (seriously, no one has even come close to beating them) and (the biggest surprise in the tournament for me) Johnny Cash. Johnny has been in dogfight after dogfight and always come out victorious, never winning by more than 3 votes. Well done Mr. Cash. You are a scrapper. Can Johnny squeak out yet another closely contested win? Will The Fab Four dominate yet another match-up? It is now up to our readers to decide.